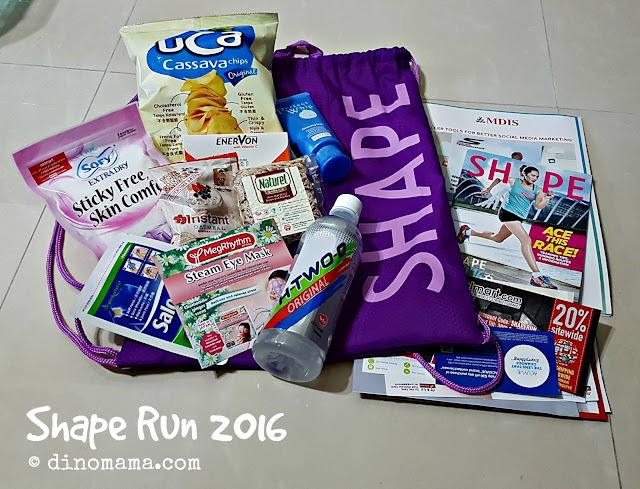 Last month we participated in our first SHAPE Run 2016, it is Singapore's first all women race but they have the 1.8km Family Fun Run category. 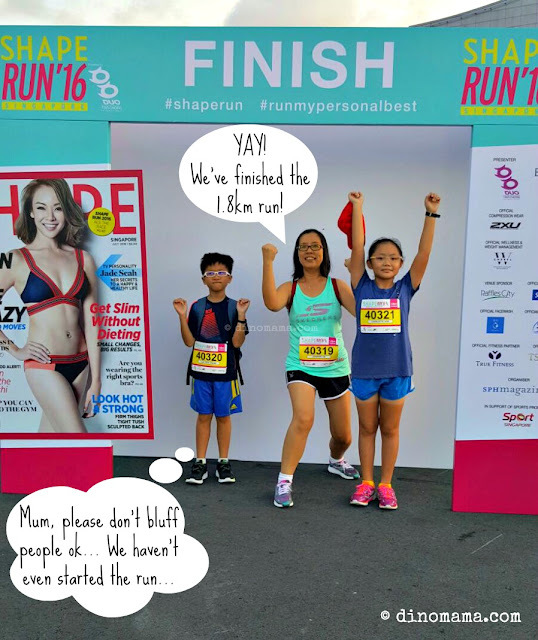 This is our 3rd family run this year~ woohoo~ on track to run MORE this year! 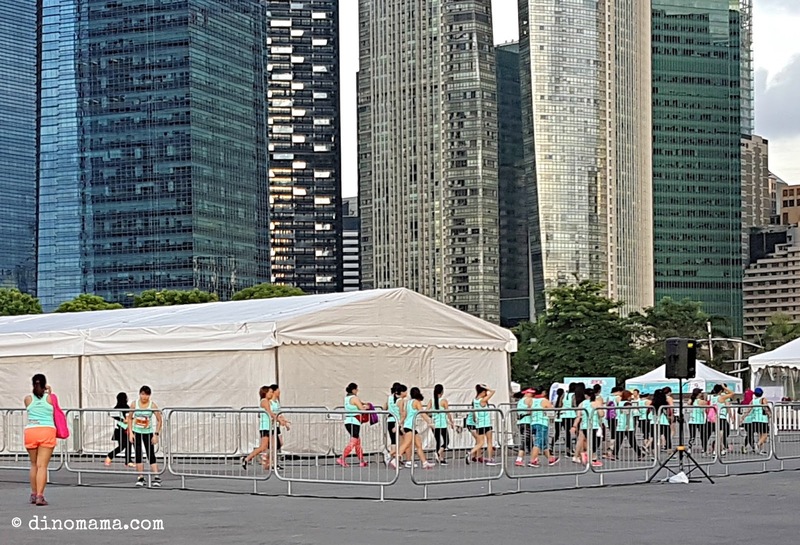 On 24 July 2016, when we arrived at the event venue I got a shocked because I saw only a few groups of ladies at the carnival. 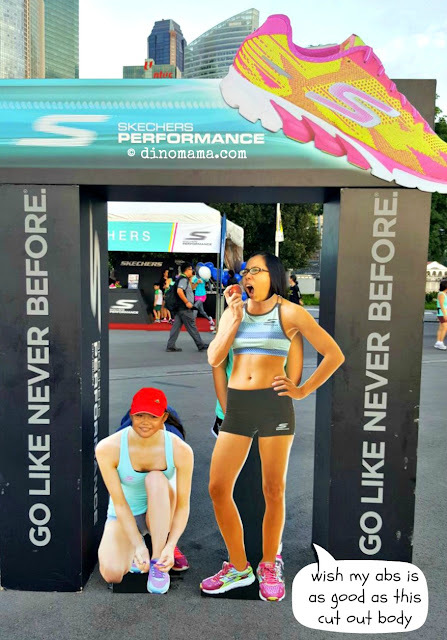 My initial thought was that the participation rate is really bad, but that could not be as this is a very successful running event and it is into its 11th year already! 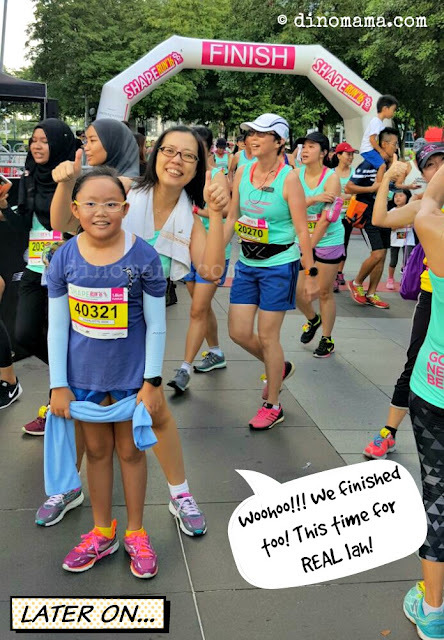 Then I remembered... our 1.8km Family Fun Run has the latest flag off time, all the other lady participants were already running as early as 6am! 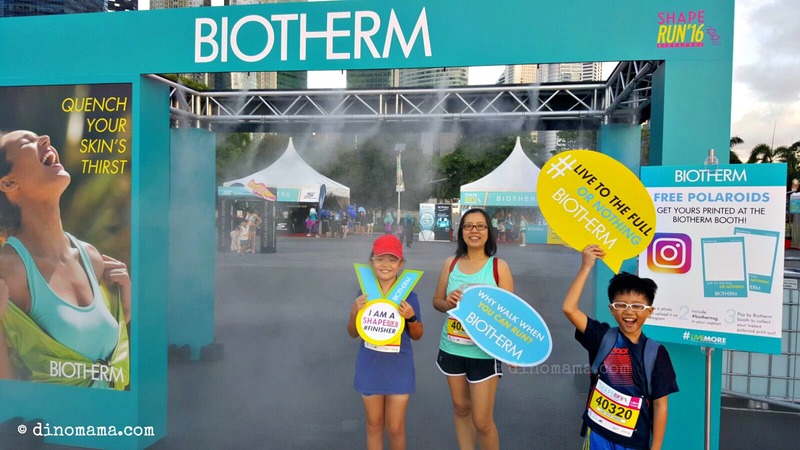 So, they were all out there running their respective 5km, 10km and 15km competitive races. A short while later we got bored... No doubt we do not need to queue for long at every booth but "No Fight No Fun"! There were no one to jostle elbows with and fight for our space to take photos or take drinks and snacks which basically took the thrill out of every thing. Soon it was time to head to the holding pen to start our fun run, we took our time to stroll there coz there were not many people at the starting line thus we thought we were early. 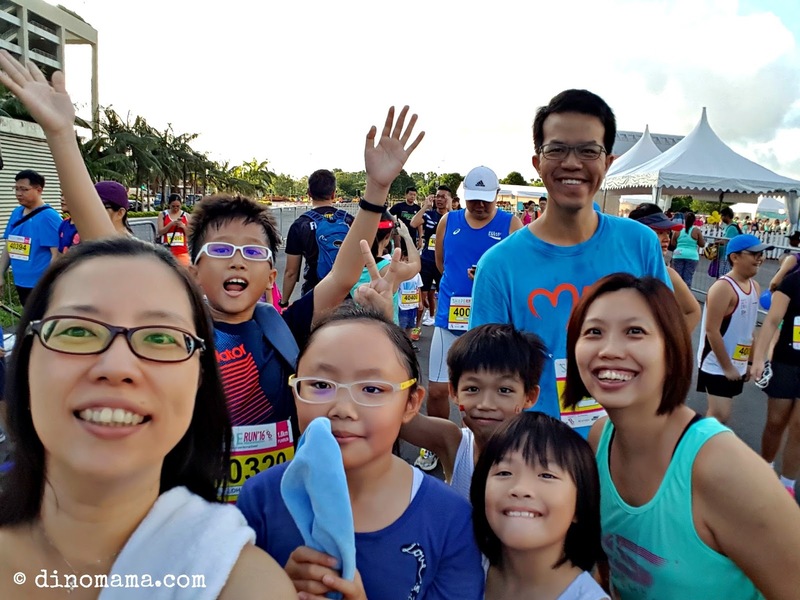 It turned out that I was not quite right... We've participated in a few family run events, there was always a huge turn out of parents with children so it was kinda shocking for me to see a smaller turn out. Perhaps it was not a family run to start off with thus the lukewarm turn out. Nevertheless, we hope to see bigger turn out next year! Here's looking at the 1.8km route, its a simple route without too many turns or slopes, thumbs up for the organisor because family run usually will includes babies in prams or on mummies, young toddlers and kids. Lesser obstacles will mean that it will not be too tiring for both parent and child. 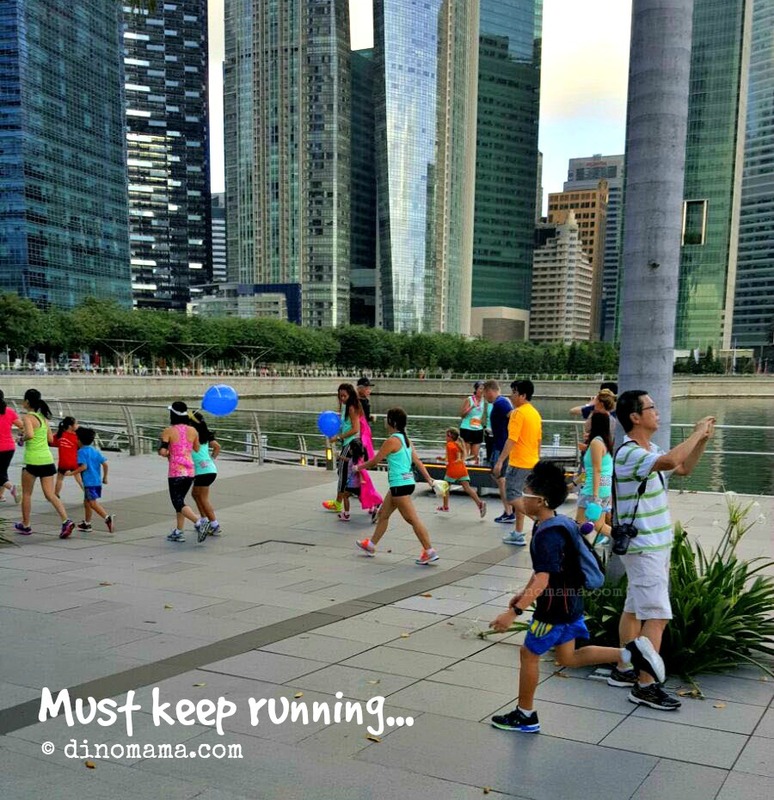 The first part of the route sees us running past some cafes and bistro along Marina Bay Sands, where the food smells heavenly! And makes my tummy growl coz I did not have any breakfast that morning *cries with tummy* There are many people running, exercising or on bicycle in this area so we have to run in care though they generally gave way to us. What's amazing with fellow sports people is they cheer you on! Even those sitting down and enjoying their cuppa after their work out. 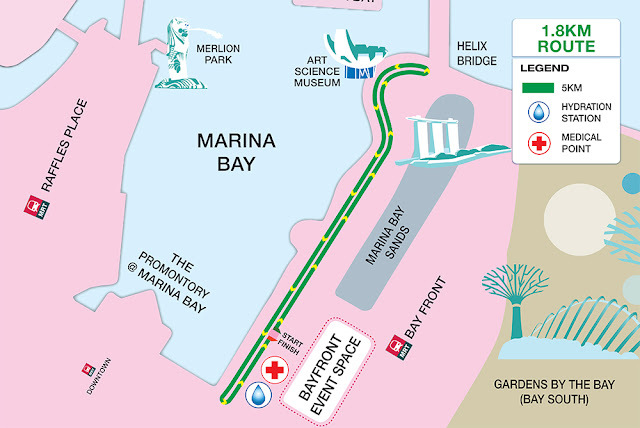 We took a loop back near the Helix Bridge and ran along Marina Bay, the calm water and soft breeze is relaxing to the eyes, mind and body thus I walked most of the way here. Plus the fact that I did not eat breakfast so am lacking of strength & energy. *Smack self* MUST remember to have a good breakfast before every running event! Along the way we saw a few younger kids who got tired and was either complaining or sitting down refusing to move, we encouraged and urged them to continue. They jumped right up upon hearing, perhaps surprised that stranger auntie talked to them lol. I remember there was this lady participant doing her after run stretch on one of the bench along Marina Bay, she cheered us on enthusiastically and whole-heartedly that made us ran a little bit faster. While we were strolling or jogging along (I've got proof, see photo below lol) by the water, DinoBoy was way way in front of us, giving all he got and running with all his might! 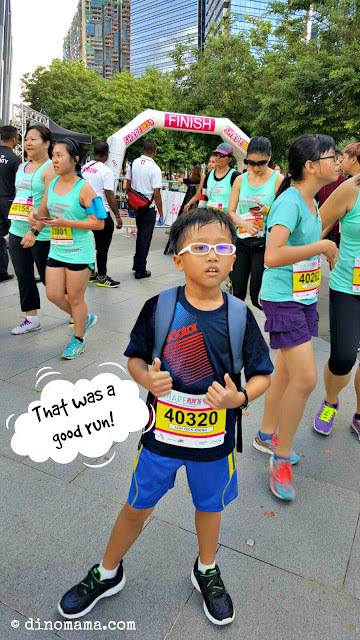 I think he finished the run in way under 30mins, great job son! Can you see the other ladies running at the far opposite side? At the end of the race, cups of cold H2O were provided for us to hydrate ourselves, bottles of mineral water were handed out too. We were given our medal and a Uncle Toby's energy bar at the same time. It was such a relieve to see the drinks that I went back to take another cup coz I needed them and couldn't wait to twist open the mineral water cap. This is a great event, not surprising since it's been around for a decade thus consider a pioneer in running events so we expect every thing to be in orderly and well organised. Having said that, I do feel a little bit left out coz all the excitement was gone together with the other participants for the other competitive categories *cries*. The carnival in a huge spacious area with the lack of crowd (coz all out running already) filling the empty space makes it look so desolated. There wasn't much entertainment for us too and we are pretty much left alone to wander around aimlessly with our kids, I do wish they have more games to entertain the kids. 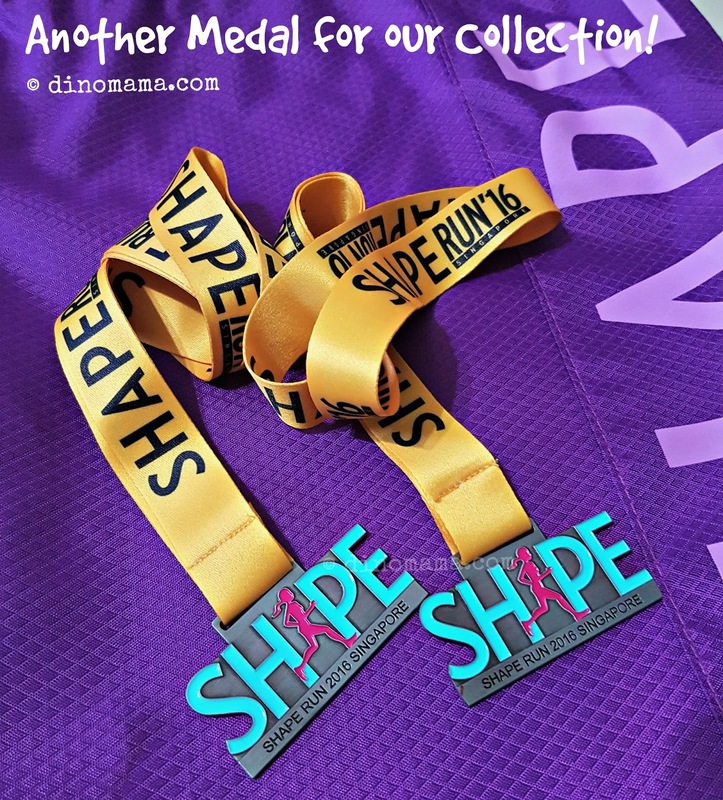 We saw some little girls and mums wearing a pink cape and wondered if we missed that in our race pack, it was only after the event that I know this was purchased separately for a good cause. This year's Shape Run is supporting Life Community Services Society to raise funds for their educational and welfare programe. Wow! I wasn't aware of that, otherwise I would have gotten a couple of those cute pink capes and run like a Super Hero that day! 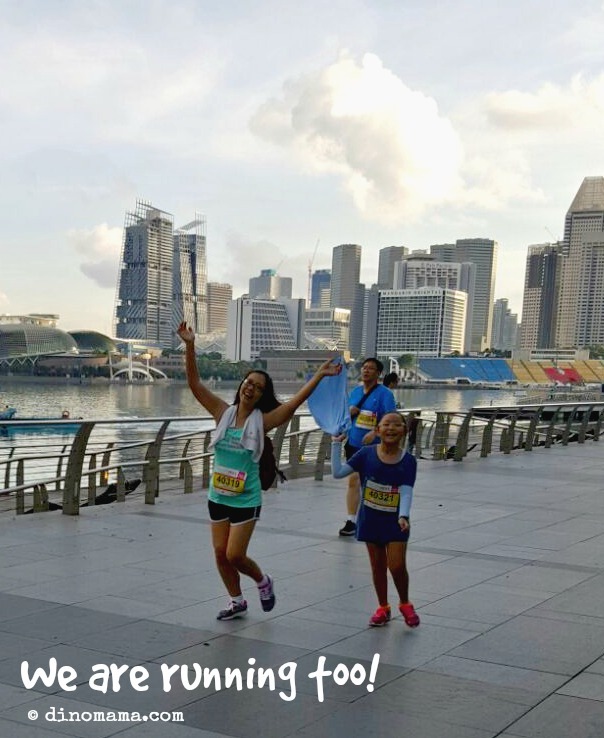 Nonetheless, cape or no cape, we ran, jogged n walked all 1.8km and we enjoyed it to the fullest! 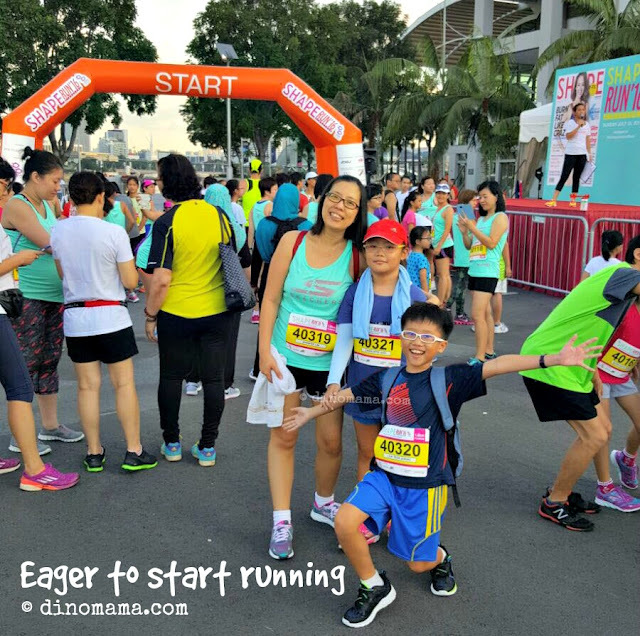 We hope to be back to the run again next year! We have written couple of weeks ago on the importance of choosing a good pair of shoes for ourselves, if you missed that post, you can read it here. The same goes for running shoes, besides comfort the shoes must fit properly from heel to toe. * Always buy your shoes, any shoes actually, near the end of the day because that's when your feet has fully swell up, fitting shoes at that time will mean that it will fit comfortably all day. * You should be able to wriggle your toes freely. * You are able to move your feet side to side without them crossing over the edge of the insole. * There is a reason why our mums told us that there should be some space between the tip of your longest toe to the shoe because our feet tends to swell due to walking and in this case running so the space should be at least a thumbs's width to allow feet to expand and still fit in our running shoes comfortably. * The sole of the shoes should be flexible too, most importantly it should bend and crease where your feet flexes. If it does not it will lead to calf strains, pulled tendons etc. * Lace up the shoes properly and walk in them for a bit to ensure that they are comfortable and fit your feet's contour and shape. And if you want to ensure your feet stays happy (like ours) every time you goes out for some sports activity you have to get them a pair or two or three of Skechers GoRun shoes! These light weight shoes together with Skechers most advance high performance technology will definitely give you an ergonomics experience that you have never felt before. Apparently there are many like-minded ladies too! They were flocking to Skechers booth to take advantage of the SHAPE Run 2016 Carnival exclusive offer of 20% discount to get new Skechers footware and apparel for themselves. Look at the crowd! 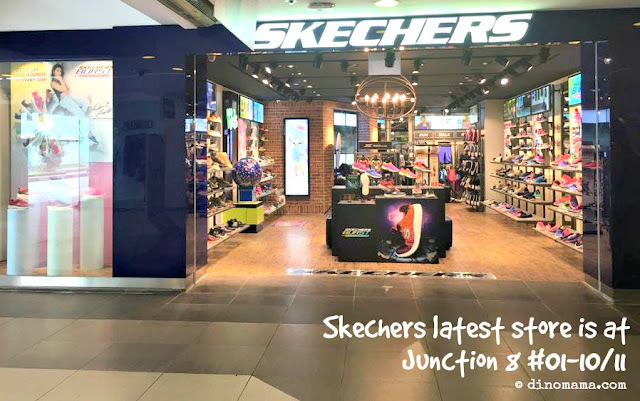 Skechers concept stores are located in the shopping malls all over the island, they also have counters in shopping stores or hotels, check the list over here. Skechers recently open their new concept stall in Bishan Junction 8! Pay them a visit if you are around the area, I guarantee you that their friendly and helpful staffs will be there to greet you and help you with any questions you have on their shoes. We know because we've been to their Takashimaya & Waterway Point concept stores and received equally warm and helpful services from them. 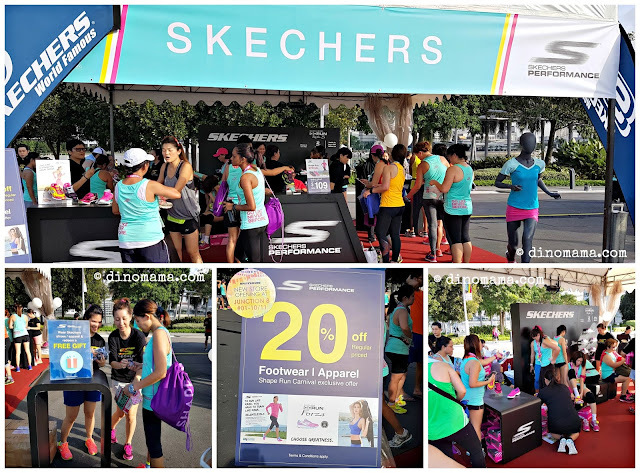 Read about our experience at Skechers Waterway Point over here. 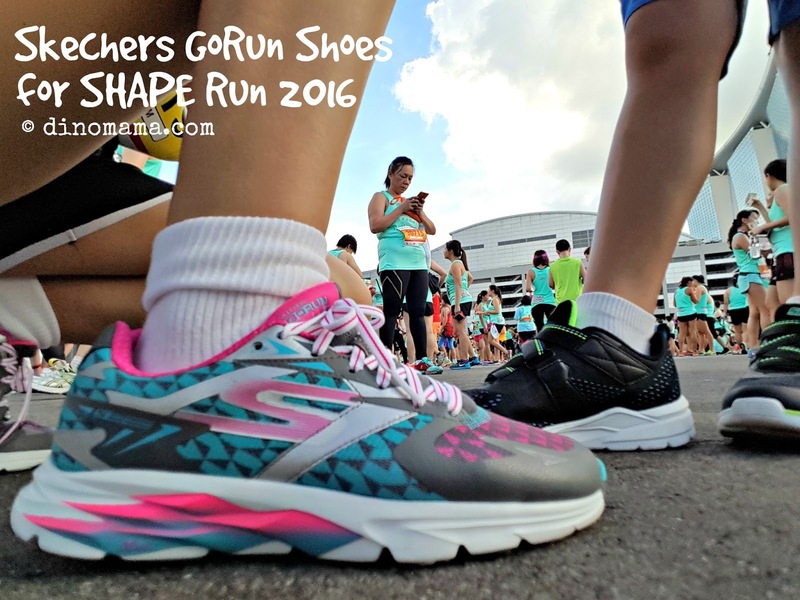 Disclaimer : We were invited by Skechers to participate in SHAPE Run 2016, they have also graciously sponsored our shoes for the purpose of this post. No other compensation was received. All opinions are ours and all photos in this post, unless otherwise credited, belongs to The DinoFamily, you may not take them for your personal use without seeking our permission.